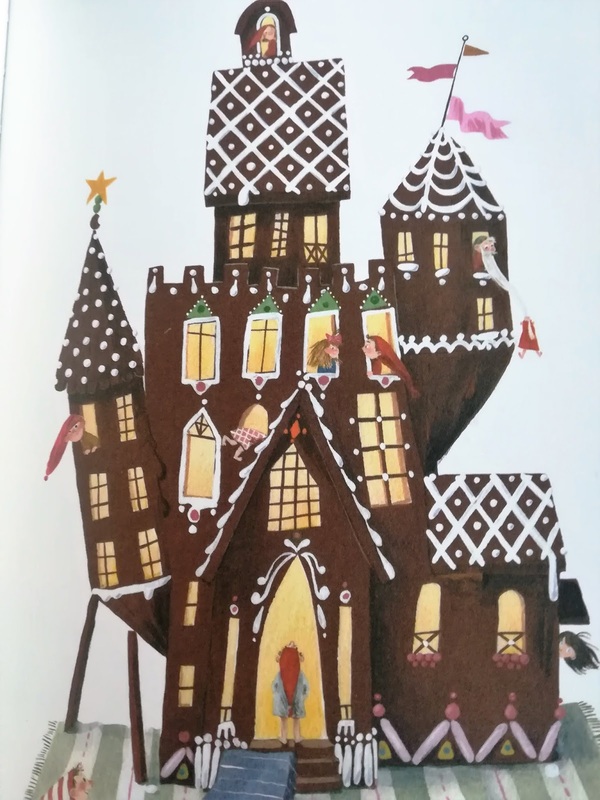 With two boys, the long lost love for children's books is rekindled. 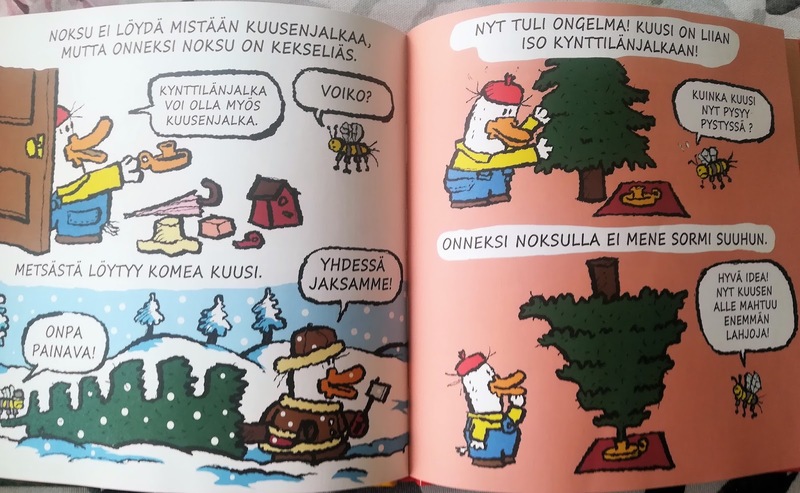 I try to explain the Finnish culture through Finnish children's books. The five Virtanens are back! Or actually they never left. There has been a steady flow of books . 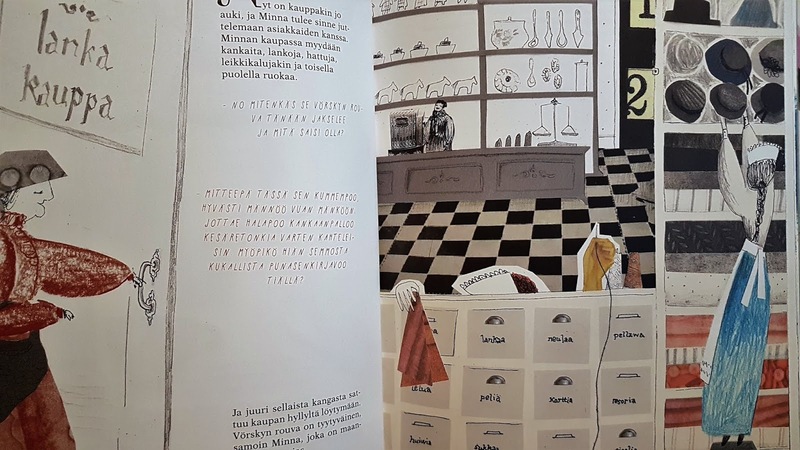 This time Easter is just around the corner and on Palm Sunday it is tradition (at least in some parts of Finland, I know that in Ostrobotnia this tradion takes place on Maundy Thursday) for children to go ask for candy. Just like they go Trick or Treating for Halloween in the US. Only on Easter the kids dress up as witches and now cats and bunnies. They also decorate willow branches which they give in return for the candy. The Virtanen's have planned to do the branches during the week, but all of sudden it is Saturday and it is snowing. The kids have very low motivation to get the branches. But they do. All the children decorate with their own style, even the boys are motivated, due to the chocolate they will get as payment. The youngest, Kastehelmi, wants to dress as a princess, which is ok. The first lady they want to wish good health tells them not to mix the western tradition of Easter witches to the Easter branch tradition of the east. Vilma, who is a bit shy and introvert, wants to go home. Luckily the younger kids encourage her to come along. 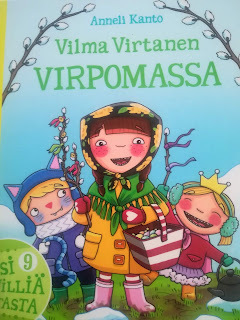 In the next house, Vilma forgets the rhyme! She panics, but Kastehelmi knows a rhyme, but it is not the right one. 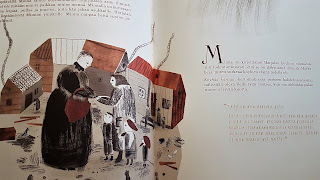 The lady in that house helps the children with a start and then Vilma remembers the rhyme too: "virvon, varvon, tuoreeks terveeks..."
When you are on a Easter tour, you have to be brave, thankful and polite. A lot for small children. When you read this book, as a parent, you also understad that not everything has to go by the plan. And let the children learn by doing. 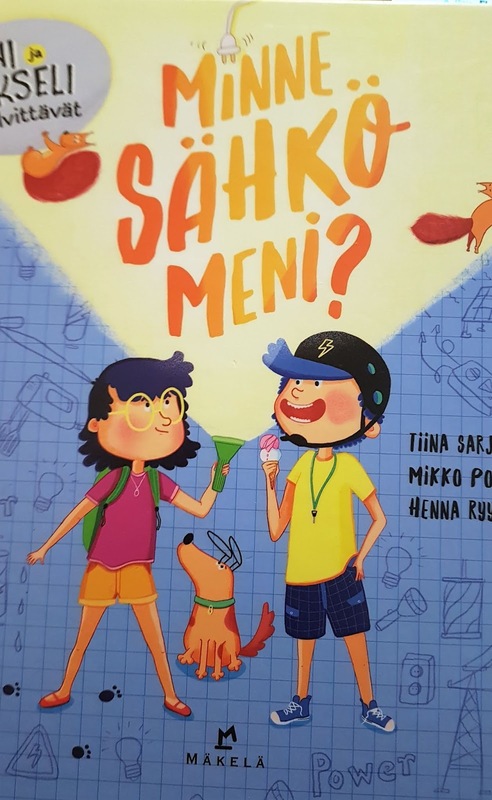 Text by Tiina Sarja 2018: Minne sähkö meni? The whole city is blacked out! 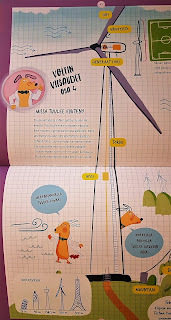 Twins Akseli, Anni and their dog Voltti (a dog with a PhD) start looking where does electricity come from. They meet a nutty professor and find out about power plants, nuclear power and even poop power in a farm. 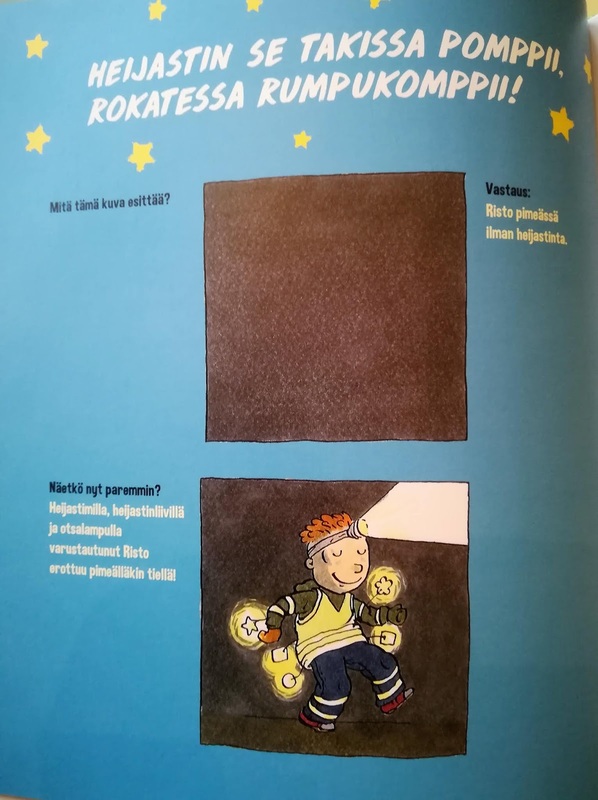 The illustrations are great and there is so much information about energy that (hopefully) kids have no more questions to ask. Except: what kind of tablet did the kids have, when its battery ran out so fast? 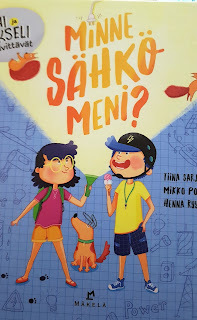 This book starts a series Anni and Akseli investigate. Can't wait for more! 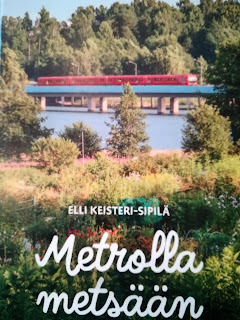 The book title is catchy, but misleading: there is no forest at the center of Helsinki and even in Kamppi nature is limited to the Natural History Museum (although it is worth visiting). But none the less, this is a great book! I learned that if you want to see nature in Helsinki it is more than just coastal vegetation. 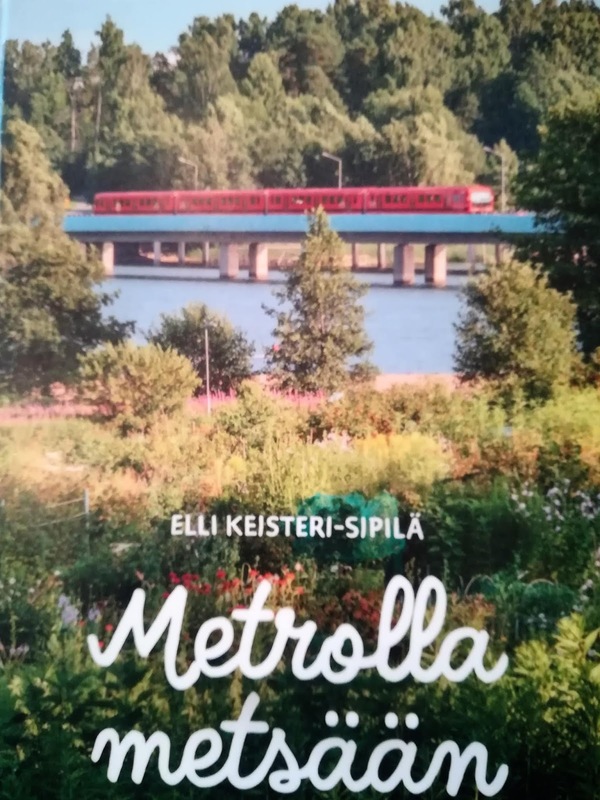 And at the center of Helsinki, you can always walk around the Töölö bay. In the summertime you can rent a bike in Espoo and you can ride the bike to shore and then rent a boat! Terrific! 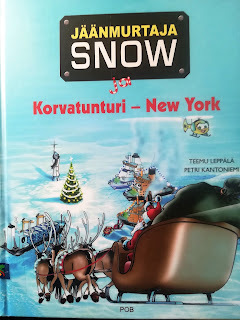 The book has maps, but read carefully, some locations may be a few kilometers away from the subway station. But since you are willing to walk in nature, this should not be a problem. At Herttoniemi is a wetland, which is protected for the birds to nest. The routes, where you can walk are marked and there are plenty of paths to follow. You can also visit some bird watching towers. The Vanhankaupunginlahti (Old City Bay), Viikki and the Vantaanjoki area create a unique nature experience. 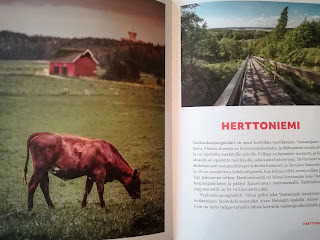 The book mentions that from Herttoniemi you can walk all the way to Kalasatama and depending on which routes you choose, you can walk 10-12 km. Matinkylä is in Espoo by the Gulf of Finland. When I think of nature and forest in Espoo, I think of Nuuksio national park. But there you cannot go by subway, yet. This book shows other places where you can enjoy fresh air. 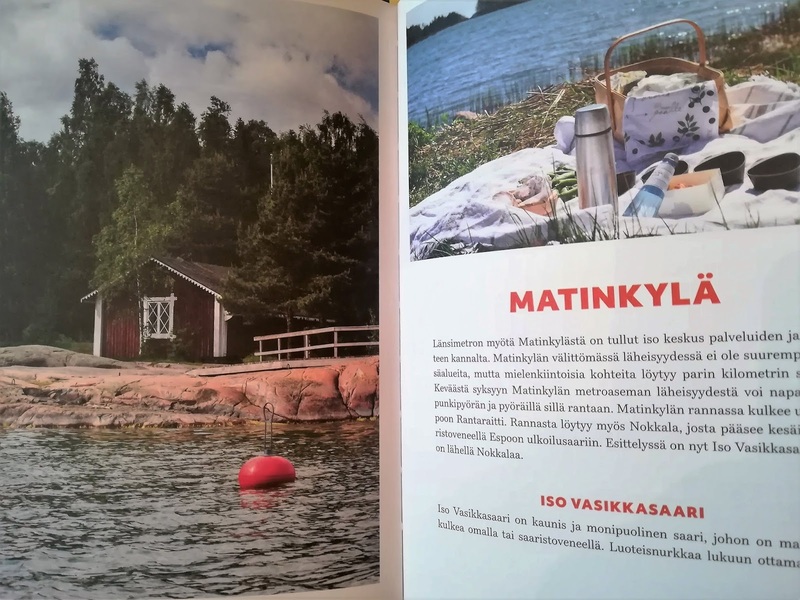 From Matinkylä station is a 30 minute walk to Nokkala, where you can take the coastal boats to the islands near by. 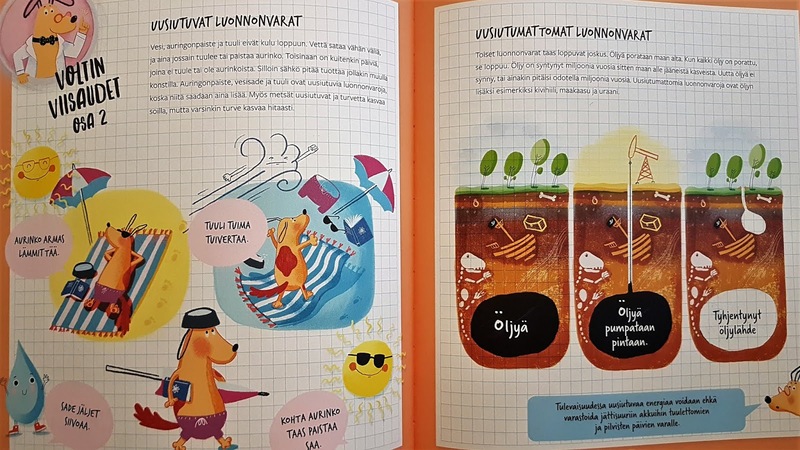 Check out Iso Vasikkasaari! 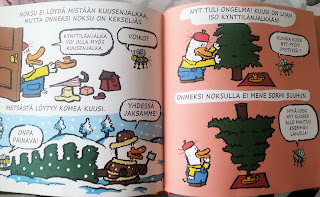 The new destinations I am going to visit with my boys are at least the Kivikko army style obstacle course and Mustavuori Grove. On the list is already visit to the Espoo archipelago. I am glad kids are taught how to behave in traffic, since so many adults do not. 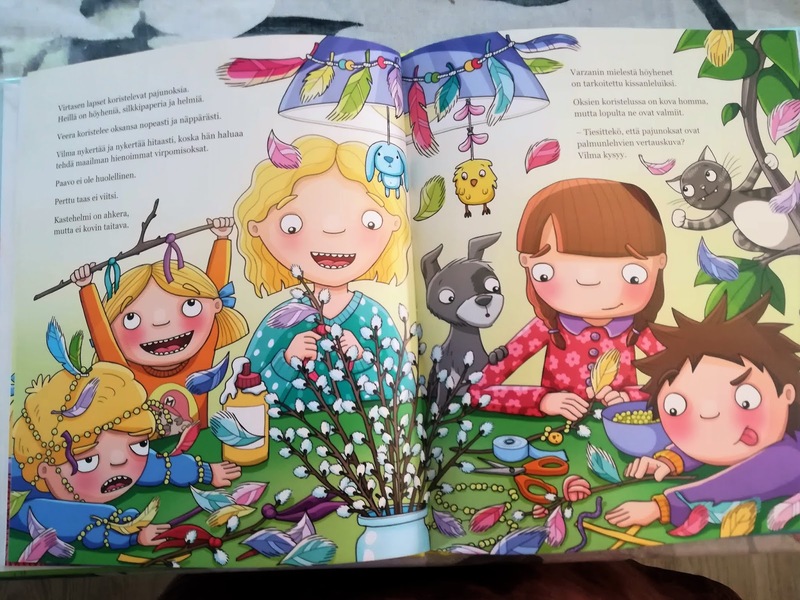 This book is makes adults look silly and it is always a big hit with the kids. 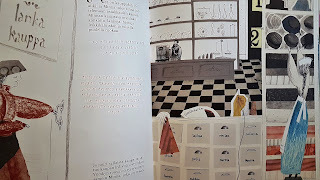 The book teaches the basic traffic signs, the rules who goes first. But at least I tell my boys that in a match between a car and a pedestrian, the pedestrian always looses. The same goes for bikes. So I cannot emphasize enough that boys should be careful. You can never be sure that the drivers see the kids. 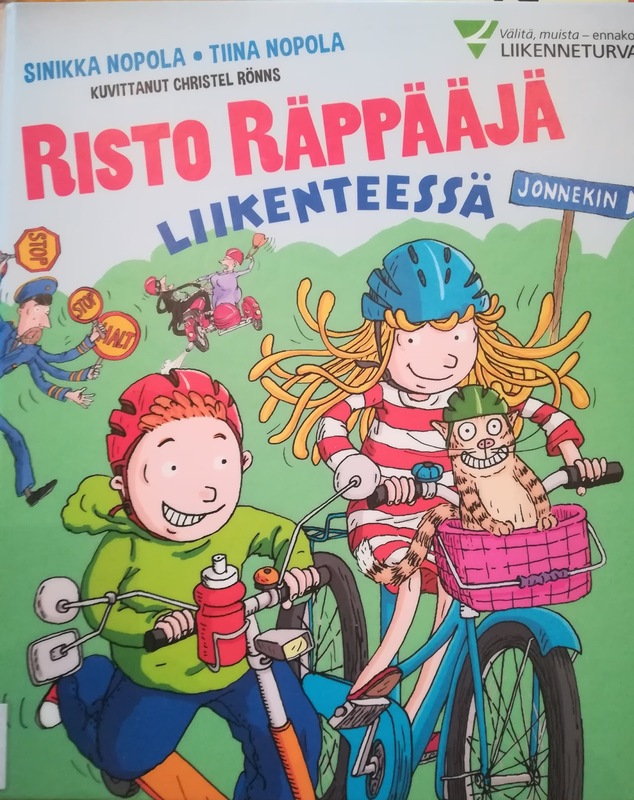 One thing that is missing from this book and is driving me nuts is in trains: people start pushing in the train even before the other people have come out! Come on. Where are the manner schools for adults? In winter time two things should be remembered: it is dark and slippery. Some how people always forget that and come November many accidents happen. So, keep your reflectors and even lamps when you walk out side. Even in cities the street lamps only light a limited area and the people blend in the shadows. Sometimes we get snow and the snowplow truck keep the streets clean. In the country side, where there are no sidewalks, change sides when the truck approaches, or you'll end up like Aunt Rauha at the bottom picture. Also the streets are very slippery, so be prepared that the cars may not stop as fast as in summer time. So when you are walking, keep that in mind. My favorite advice in traffic: no sudden moves! That eliminates some accidents. Watch out for the snow plow truck! Icebreaker Snow is helping a ship from Chile to come to harbour, when he sees Santa Claus parachuting next to the lighthouse Kraaseli. 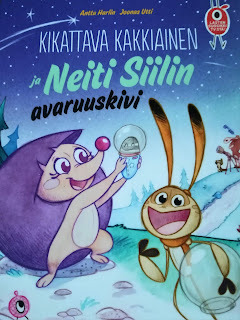 The reindeer haven't noticed anything and are headed for Korvatunturi. All the icebreakers are called on the scene. Santa had been test flying the reindeer and now they have to get a message to Korvatunturi to get the reindeer back. 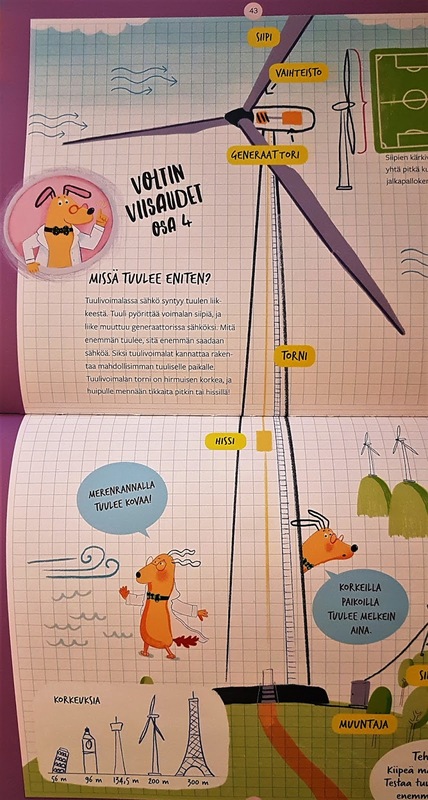 Kraaseli sends a radio signal to Ounasvaara observation tower, who has just seen the reindeer pass it. 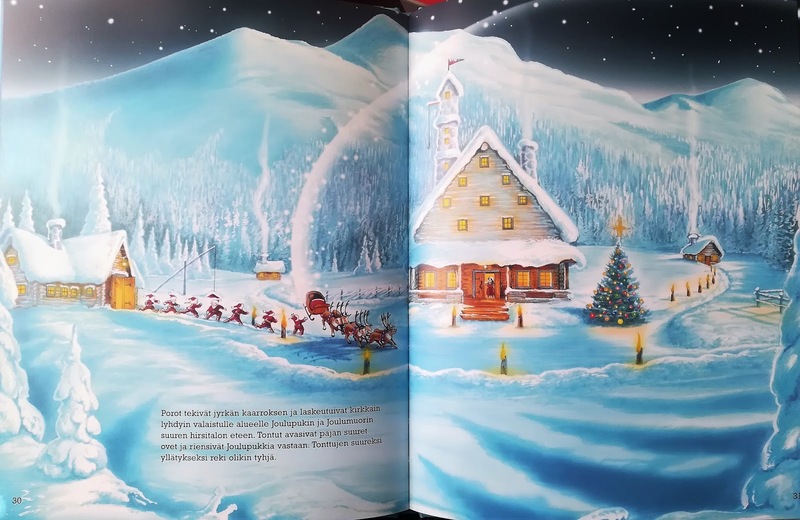 The reindeer reach Korvatunturi and the elves see that the sleigh is empty. 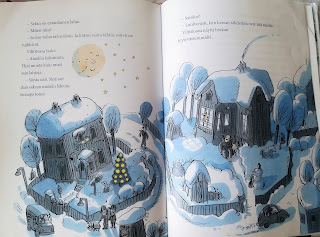 The Watchtower at Korvatunturi informs Kraaseli that the reindeer have landed in Korvatunturi. Kraaseli tells her that Santa Claus will come back to Korvatunturi with a helicopter. Christmas is coming and Santa is in a hurry. The reindeer meet Santa half way and helicopter Harriet lowers Santa to the sleigh in the air. Icebreaker Snow and the other wait for news, but they have other work to do, help ships get through the ice to the harbor. 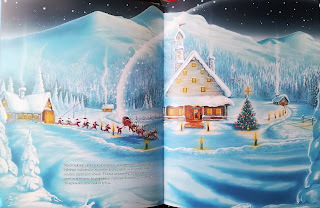 Soon Snow and the others see Santa, who had managed to deliver half the presents to the children all around the world, bring them presents. Then Santa must continue to New York and the western hemisphere with the rest of the presents. 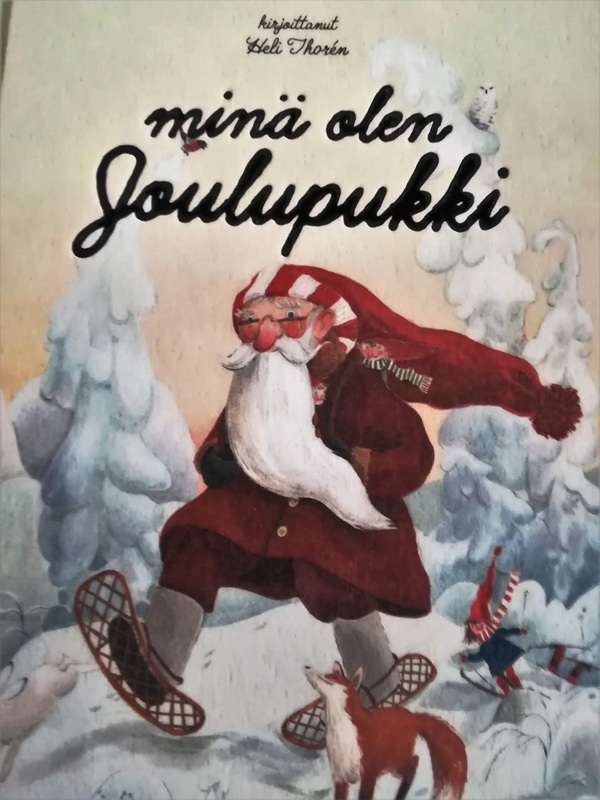 Mikko Kunnas 2015: Hauskaa Joulua, Noksu! Not your average Christmas. 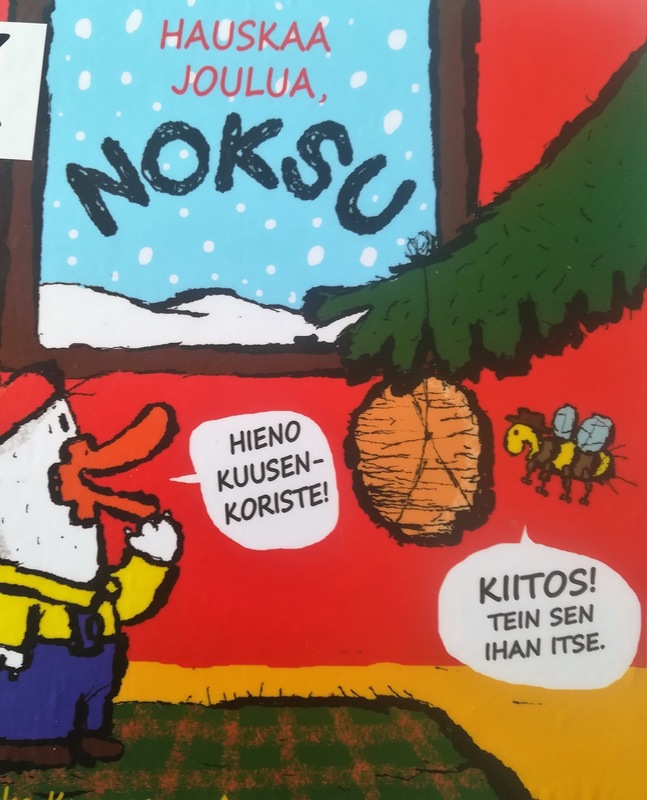 Noksu is sending old slices of cheese as Christmas cards, using bee hives as decoration and many other odd things. 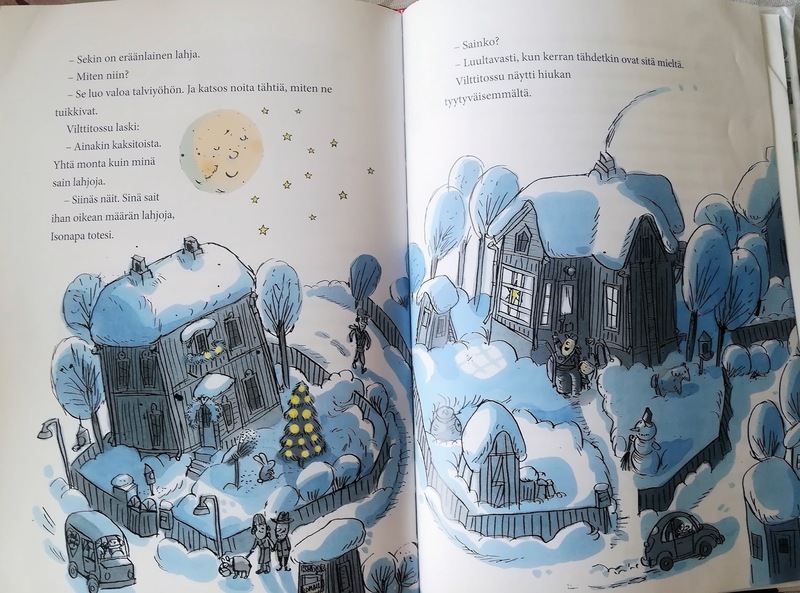 Very cute comic-like book about different types of Christmas traditions. It is written in capital letters so even the early readers can read it themselves. Description of Santa Claus's every day life. What is favourite food? What does he do on vacation? Santa Clause also reveals times when he and Mrs. Claus fight: when Santa Claus does not get enough rest. 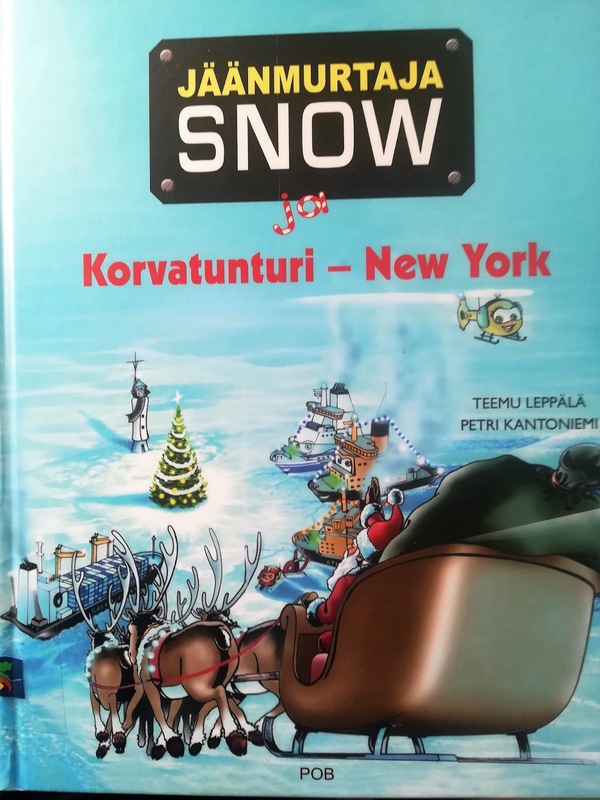 The book makes Santa look like a man rather than a myth. Refreshing. 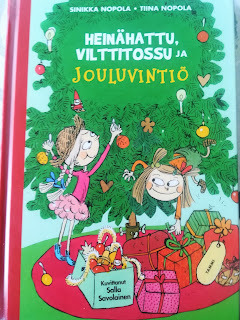 In the end is room for own thoughts: you can write the best Christmaspresents you have ever gotten and what were the worst? What makes a good Christmas? It is almost Christmas and Quiltshoe is afraid that she won't get enough presents. She sees a charity collecting toys for the less priviledged kids and decides to be a begger to get some toys for herself. That does not work, so she becomes a player at the Star singers on the street. That does not work either. The girls' parents call Hayflower the Christmas child, because she is being nice and doing all the chore. Now what can Quiltshoe do to be called the same? She sure is going to try. Her family is worried, because she has never been this helpful and selfless. When Santa brings the presents and there is just as many for Quiltshoes and there is for Hayflower, Quiltshoe gets mad. She has been so nice! How to teach a child the meaning of Christmas? Poppy the Hedgehog finds a space rock. The other animals think it's just an ordinary rock. Gigglebug helps Poppy to take care of the rock and get ready for a trip home, where ever that may be. 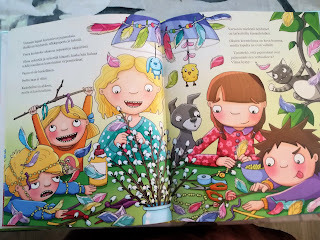 Other Greengown Forest friends laugh at Gigglebug and Poppy, but they don't give up. I won't reveal the result. 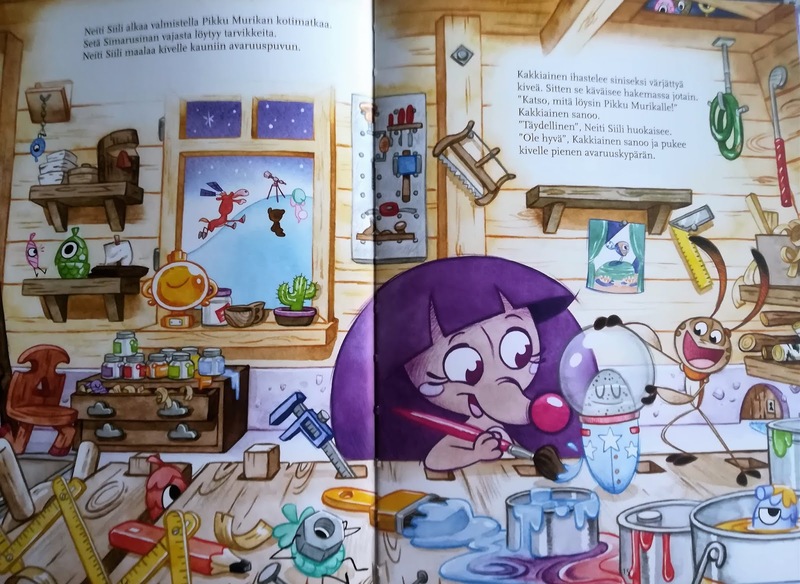 The lesson here: imagination is important, believe in yourself. I really like Gigglebug, its kindness and sense of humor. I am only sorry that my boys have outgrown the stories. Why haven't I? Gigglebug finds a helmet for the rock. 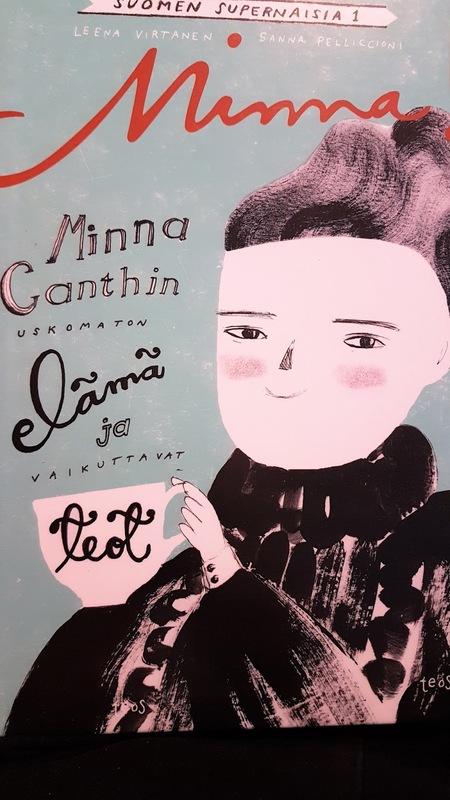 Minna Canth, (born 1844) is one of the most important authors in Finland and one of the first who wrote in Finnish. 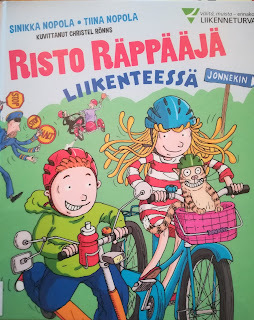 Previously Finnish authors wrote in Swedish. She was a widow with seven children, ran a yarn shop and wrote books, plays and articles. She wanted to change the world, when others wanted it to be the same, she defended the poor, of which nobody cared and she encouraged women, who did not have even the right to vote or to get an education. 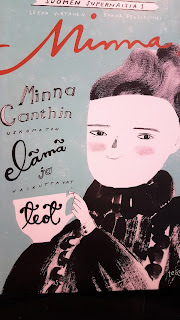 Minna Canth fought for equality. This book is the story of Minna and her amazing deeds. She caused many scandals by suggesting in her plays that the working class and women should have the same rights as upper class men. "What would Minna do now, if she lived?" Next year celebrates 175 years from Minna Canth's birth. I bet other books will be published of Minna then. 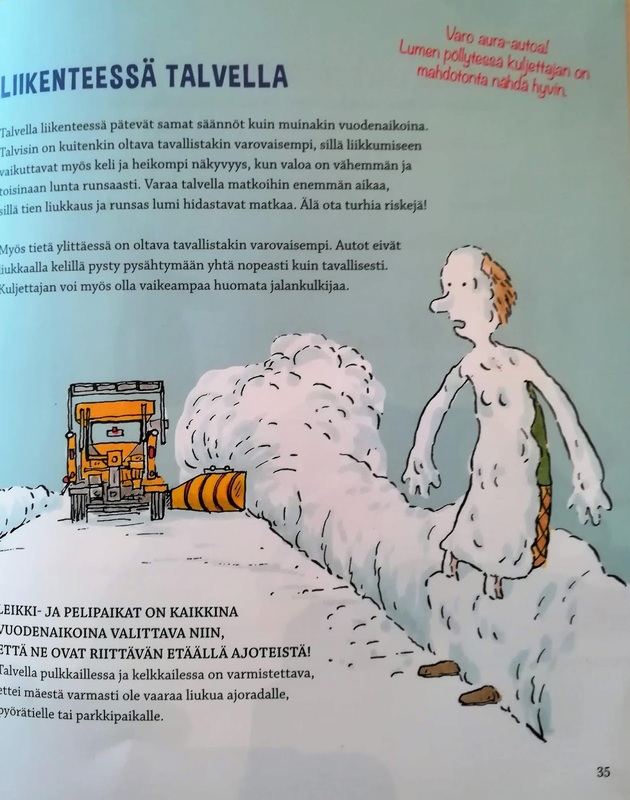 The book is labeled Finnish superwomen vol 1. Cannot wait how many volumes this book series has. 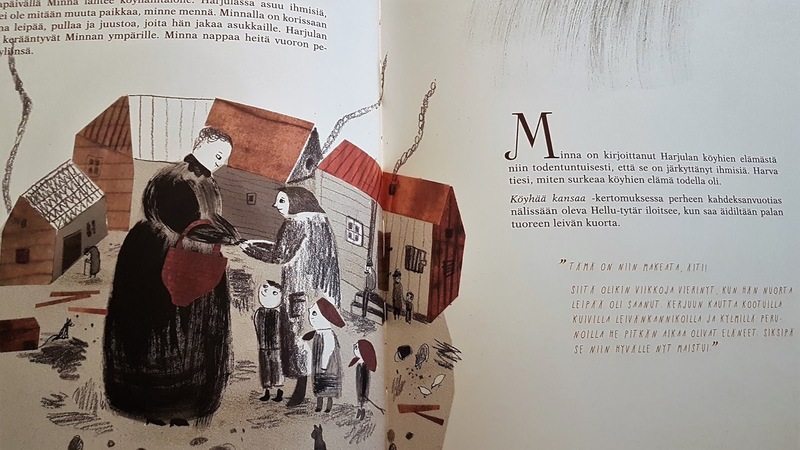 Minna visits the poor and writes realistically of their life. This too shocks the upper class.